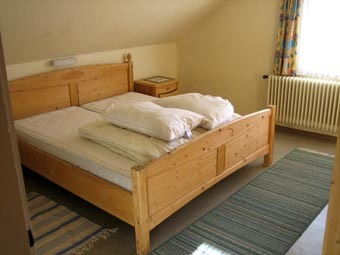 Michlbauer is a very cosy and friendly family farm pension. 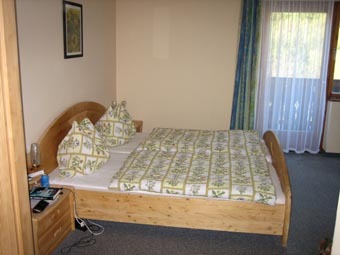 It is situated within walking distance from the centre of Schladming in the lovely Untherthal. Cross country tracts / walking paths are around the corner. 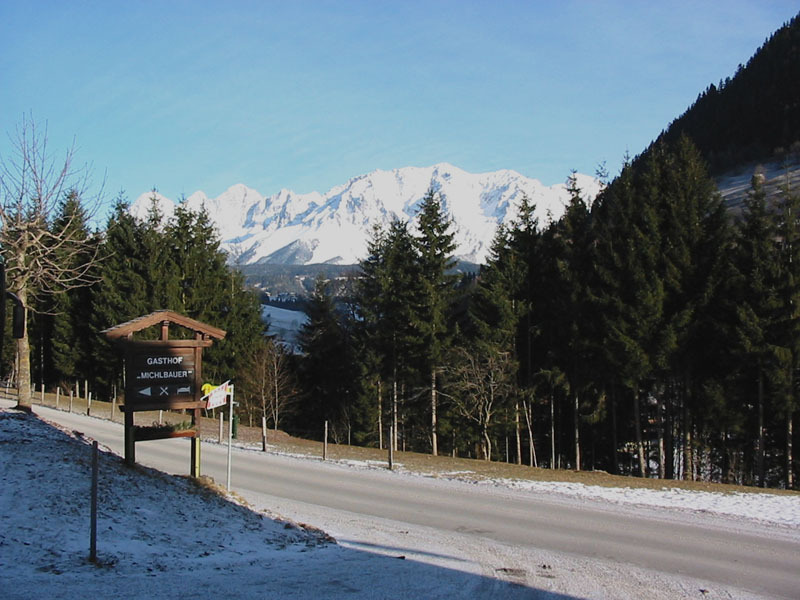 You will have a 10 minute ride by the ski busses to the slopes. 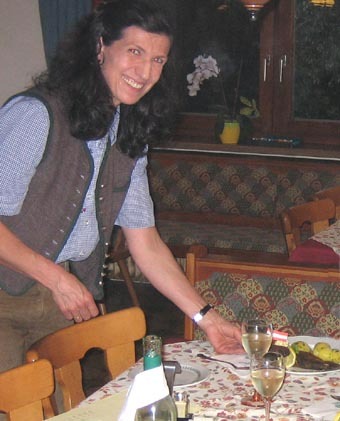 Owners and managers of the pension is Reinhard and Cissi Pilz. The farm has been in the family for more than 300 years. 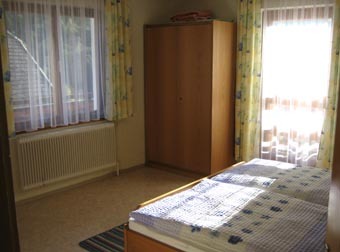 Grandfather Pilz started the pension in the 1950-ties. Reinhard is still working the farm in parallel with the pension and there are cows, pigs sheep and a horse. 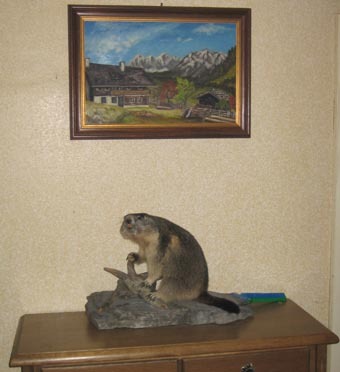 This, in combination with hunting local game, makes the pension self supplied with meet of the highest quality. 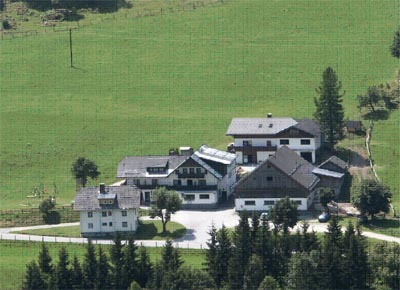 Michlbauers high quality is in it's atmosphere, surroundings, food and service - not so much in marble floors. 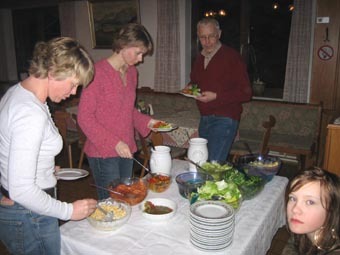 Silence and fresh air can be experience and you are hosted by warm and friendly people. 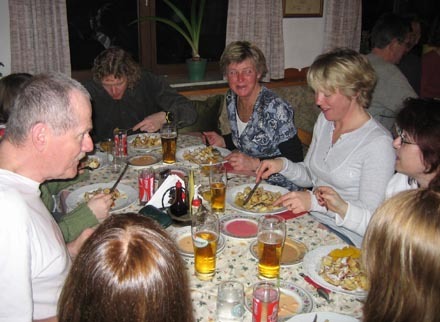 All our guests, for more than 10 years, at Michlbauer has been very satisfied. 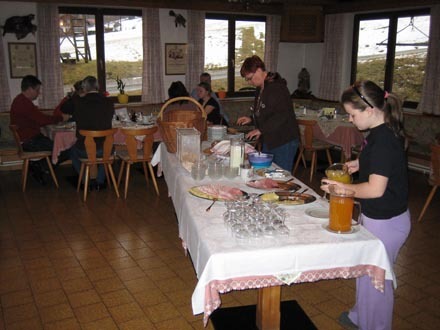 The breakfast buffet includes everything you need to prepare for a day on the slopes , hiking or biking. The food, many times produced on the farm is fantastic. Mamma Pilz is still main cook and she knows her stuff. 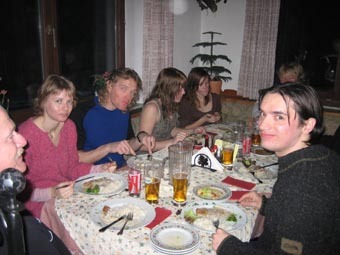 The tree course dinner is accompanied with a rich salad table. 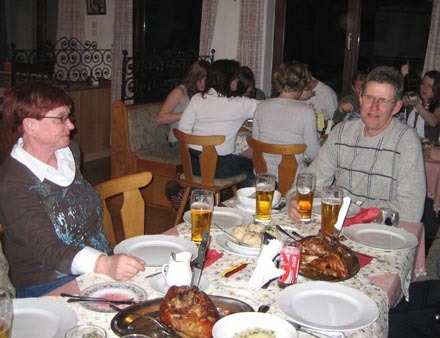 Michlbauer offers - if you like - genuine traditional dishes such as Kaisersmaren and Schweinehaxe which is enjoyed on the pictures below..
Michlbauer offers two categories of rooms. 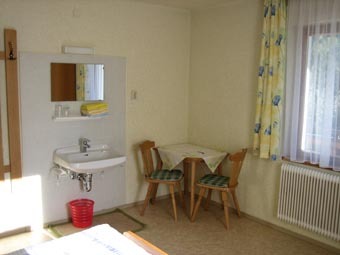 The standard room will have washbasin in the room, shower and WC in the corridor. 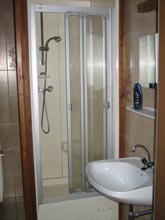 For a moderate extra cost, you will have shower and WC in your room and also satellite TV. 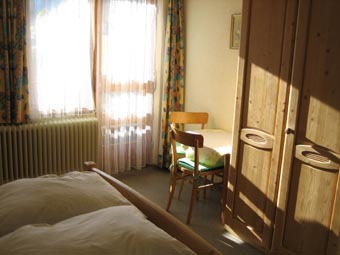 All rooms, independent of category are roomy with comfortable beds. 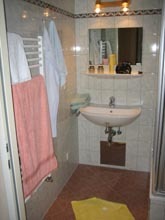 For a moderate extra cost, you will have shower and WC in your room and also satellite TV. View from the balcony of room 9. 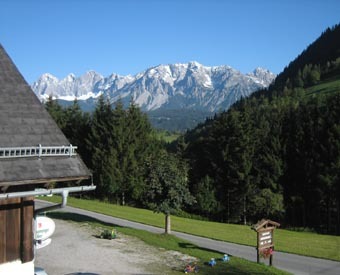 Schladming is easy to reach by either of the two motorways A10 to the west and A9 to the east. Transfer time from Saltzburg airport is less than one hour. Transfer from Munich 3-4 hours depending on traffic. You have two alternatives at Sagreb; driving via Ljubljana will take you to A10 and driving via Malibor to A9. The later alternative is faster and on better roads. It was my impression from the winter 2006/07 that there also was less traffic, and less road works, on this road. To avoid traffic jams around Munich drive via Berlin if you drive during the day or expect to pass Munich in the morning. The ferry Gedser - Rostock is then the best alternative. From the ferry, drive towards Berlin. Take A9 befor Berlin for aprox 250 km, then A72 later towards A93 Regensburg. 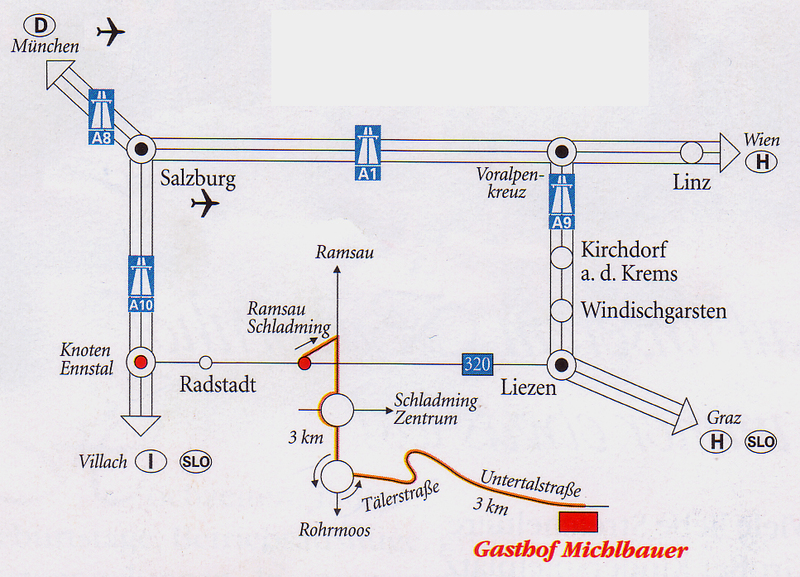 At Regensburg take A3 to Passau and then A 10 towards Linz, later A9 towards Graz.The take-of for Liezen and Schladming is directly after the toll station. If you do not pass Munich (or Hamburg or Hanofer) during the day, then it is slightly faster to take the ferry Rødby - Puttgarden and drive Hanover, Kassel, Munich and then A8 - A10 and leave A10 at Radstadt.